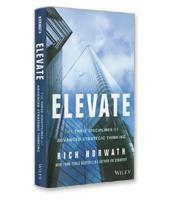 Strategy expert Rich Horwath focuses on advanced strategic thinking that will drive results in the short-and long-term. His three-discipline approach breaks strategy down into its fundamentals: Coalesce, Compete and Champion. Horwath’s practical framework will help leaders keep their careers vital through innovation and inspiration. What strategic thinking really means. How executives can practice strategic thinking daily to guide their businesses. How to use a concrete framework to keep your career vital through innovation and inspiration.